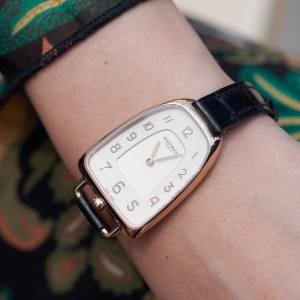 Hermès is among the few brands at SIHH with a portfolio far broader than watches. The company is a major player in the fashion and accessories industry and dares to approach genres from a funny perspective (just think about the video animation series they create on social media for various occasions – this time for Valentine’s Day). Because they have a very strong identity, they can afford to play, which gives birth to creative novelties. This is true of the complete range of products, including the watches. 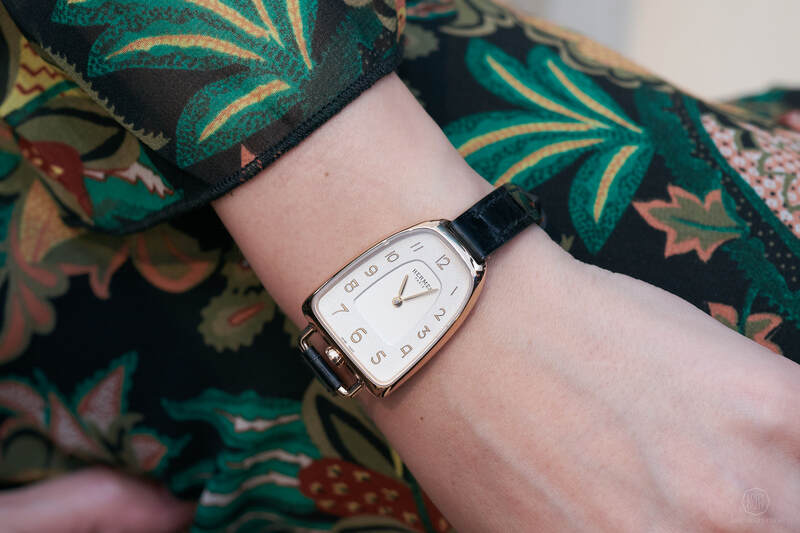 Although working with one of the highest regarded specialists of mechanical movements Vaucher Manufacture Fleurier (even being shareholders), Hermès’ philosophy is not about the taut counting of seconds, but more about living in the moment. Just like in their creations, they put careful thoughts into the presentation of pieces; let it be a fashion show or their booth at the SIHH. 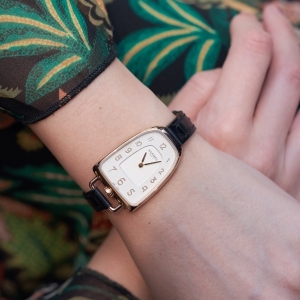 At their debut at the Geneva show last year Hermès collaborated with designer Denis Montel to evoke the joy in the serious mechanism. In 2019, the brand welcomed visitors on a minimalistic stage built around a huge rotating moon. Designed by a Japanese artist Hideki Yoshimoto, the surface of the 3.5m diameter installation was made from recycled solar panels, which will be recycled once again after the fair. 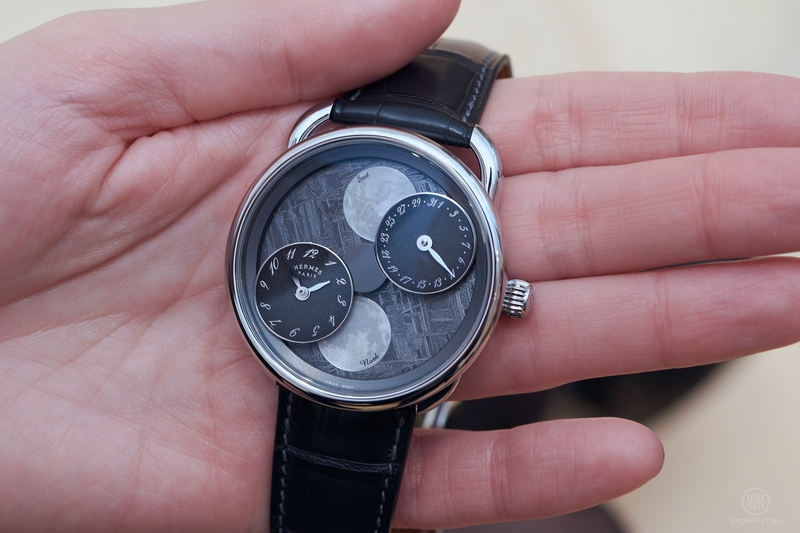 The hanging moon referred to one of the highlights of the house, the Arceau L’heure de la Lune watch. 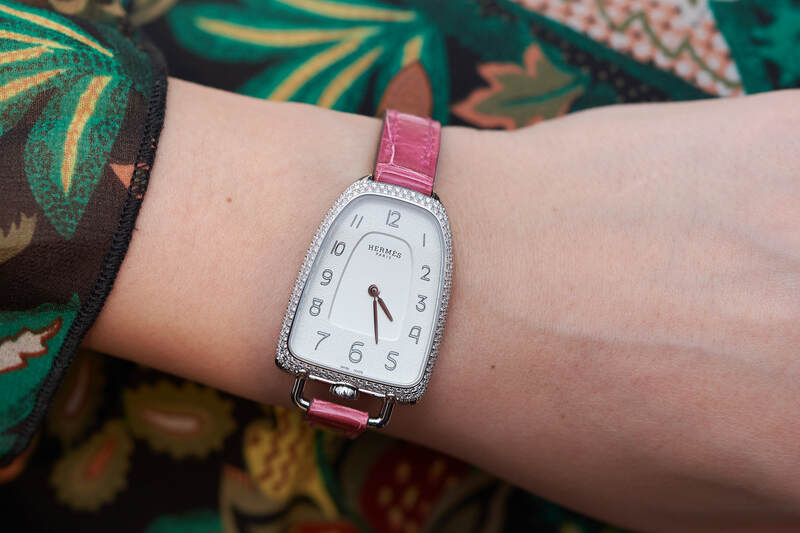 Last October the Maison invited a small group of journalists to the Canary Islands of Tenerife and revealed the timepiece at the Observatorio del Teide. Due to its geographic location and climate conditions, the Canary Islands have one of the three best spots in the world for celestial observations. 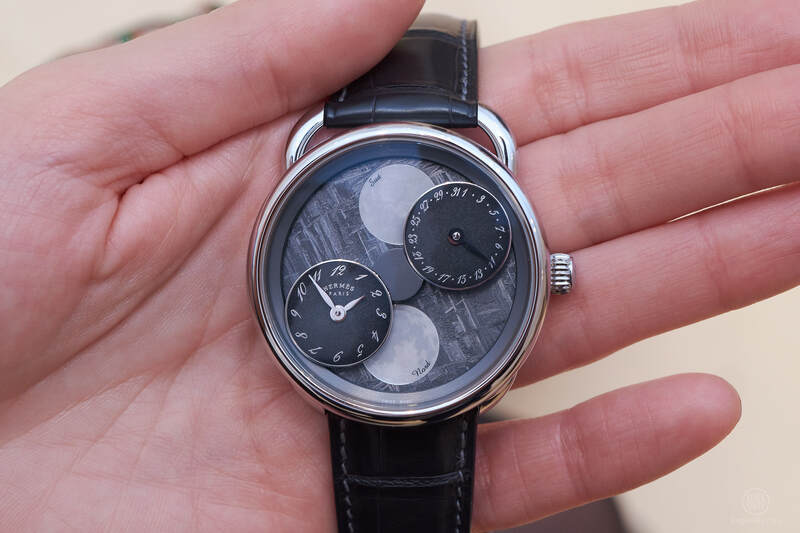 At SIHH 2019, Hermès showcased the Arceau L’heure de la Lune to a broader audience. 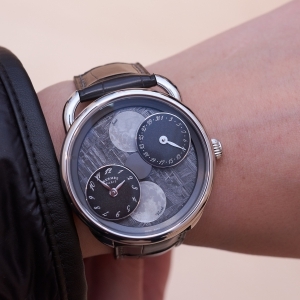 The dial has two mobile sub-dials – one for the time and one for the date. 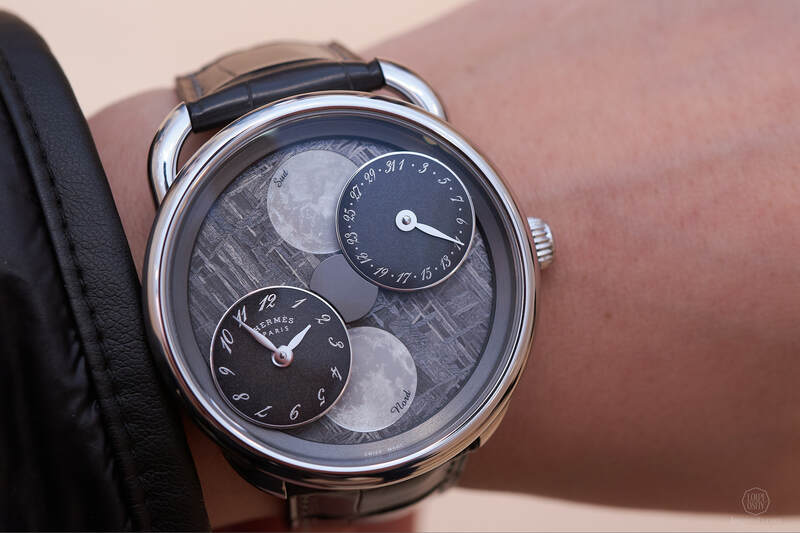 These mobile counters circle around the dial of the watch day-by-day eclipsing two moons located at 12 (Southern hemisphere) and 6 (Northern hemisphere) o’clock. Their dance shows the actual phases of the moon in both hemispheres. 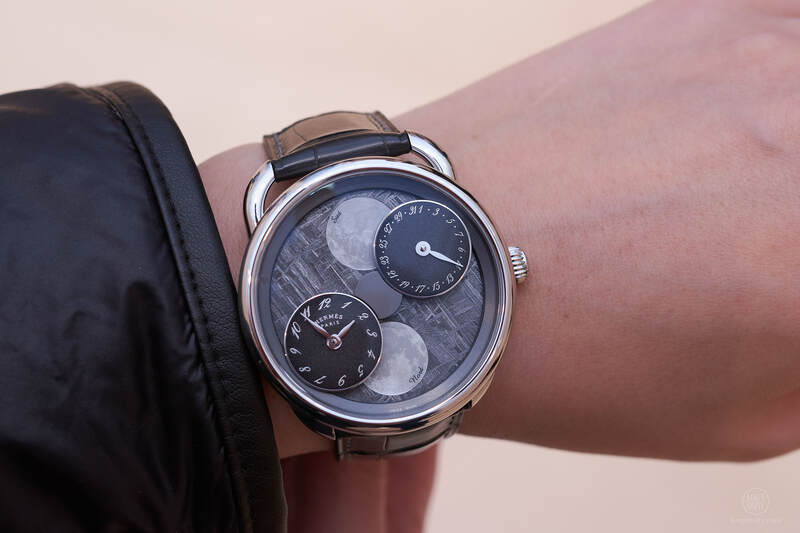 Based on the same 43mm white gold case two 100-piece limited edition versions were introduced: one with an aventurine dial and white-lacquered mobile counters and the other with a meteorite dial combined with gradated grey-lacquered sub-dials. 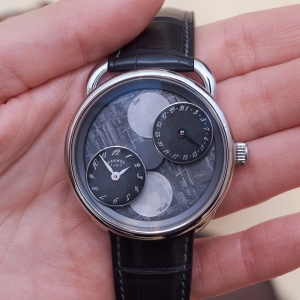 The moons are mother-of-pearl and the Southern moon received a special little additional Hermès touch: it depicts Pegasus subtly etched on its face, inspired by the ‘Pleine Lune’ motif designed by Dimitri Rybaltchenko. 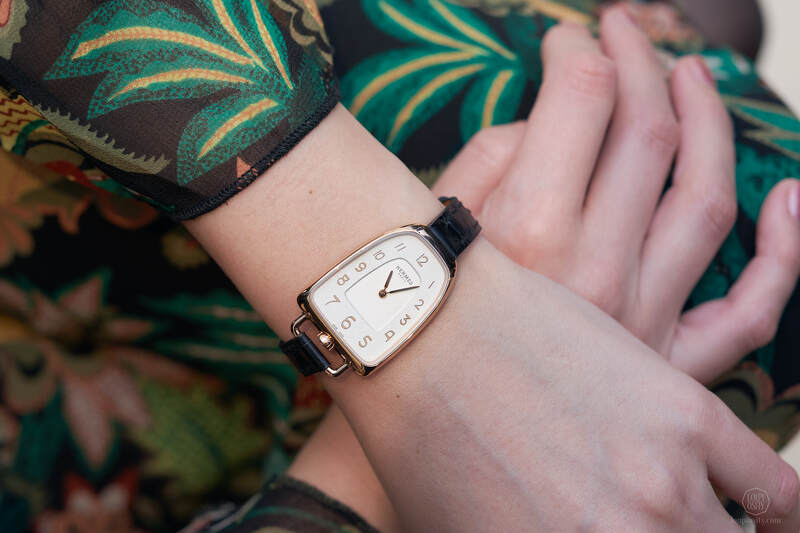 The timepiece is a brainchild of Philippe Delhotal (Artistic Director of La Montre Hermès) and Jean-Francois Mojon (founder of Chronode, known for the development of movements and complications for many great watch brands). 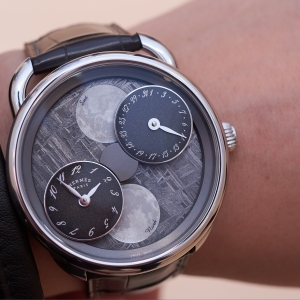 Mr Mojon created a proprietary, patent-pending module for the Hermès Manufacture H1837 movement that drives the unusual moon-phase display. As the story goes, on a short flight from London to Paris in 1983, Jean-Louis Dumas (chairman of the Hermès group from 1978 until 2006) met Jane Birkin, English actress, singer – they were seated next to each other. She placed her bag in the overhead compartment of her seat but the contents fell to the floor… for the rest of the flight they chatted about her ideal bag and soon a fashion icon was born. 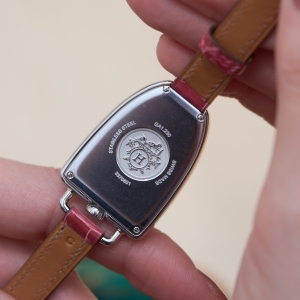 Many Hermès designs gave a creative solution to a typical problem. Because you tend to look at things too close when you’ve been working on them for a long time, they like to take a step back and invite ‘outsiders’ into their creative process. This is true for their timepieces as well. The eyes of an industrial designer who has not done watch designs before can open new points of view. 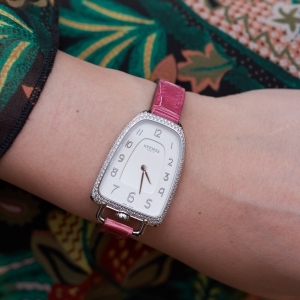 Hermès introduced a new feminine collection dreamed up by Ini Archibong. Ini Archibong was born and raised in Pasadena, California and graduated from the Art Center College of Design and ÉCAL (École cantonale d’art de Lausanne). He is an industrial designer, lately also known for his collaboration with UK brand Sé called Below the Heavens, a 22-piece furniture collection. Hermès asked Archibong to show his take on a Hermès woman in 2019. He immersed himself into the archives of the Conservatoire des créations Hermès in Pantin, the north-eastern Parisian suburb. The stirrup shape so much associated with the original equestrian accessories business of the company caught his eyes. 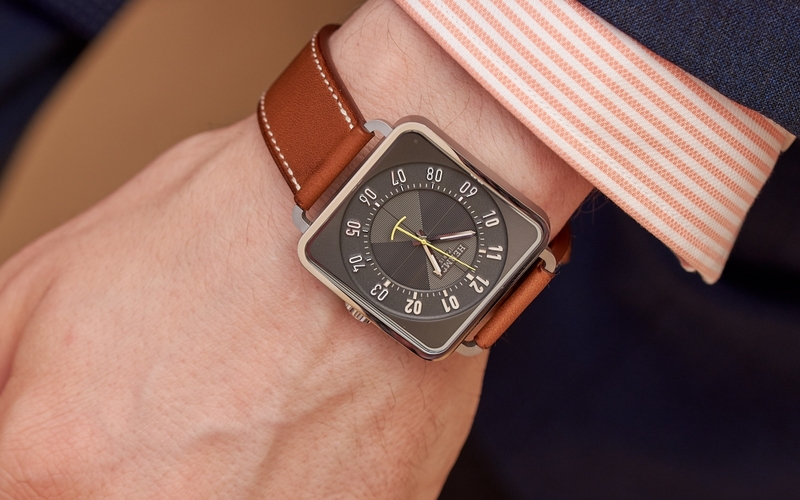 He drew a case that follows its lines and sits on the wrist nicely. There are no sharp edges or corners distracting from the view, even the crown hides discretely down at 6 o’clock. ‘The material I work with is light. I create shapes to catch the light. I have learned to design aerodynamic shapes and futuristic lines that use surfaces in order to explore light effects.’ – explains Archibong. 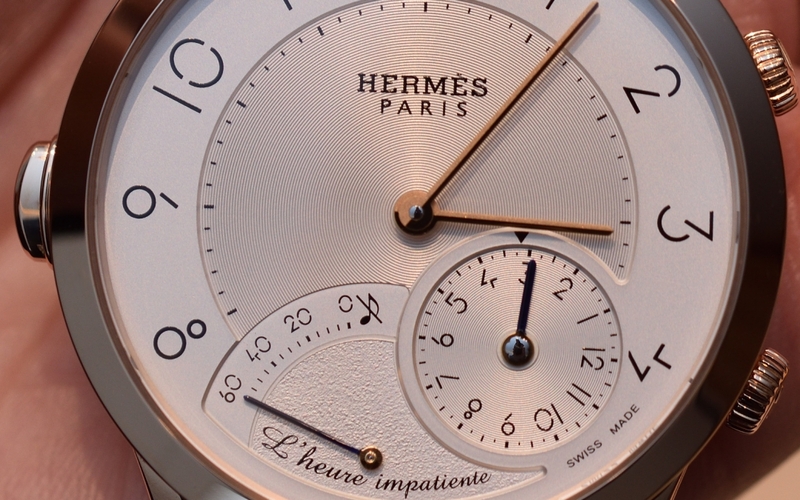 The dials are grained and silvered with an opaline centre and silver-powdered transferred Arabic numerals. A cool little detail: number 8, the symbol of infinity became an inverted stirrup. 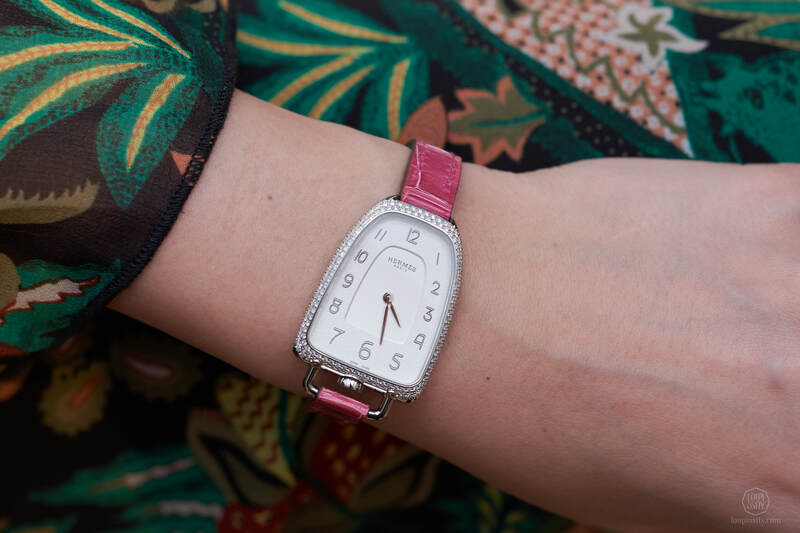 At the presentation Philippe Delhotal emphasised that it was very important to create a new ‘icon’ for the women of our times. Ini Archibong collected pictures about women in metropolitan areas – he wanted to observe the common style elements on women living in different cities and approaching femininity differently. There was something linking them all: they were in motion. 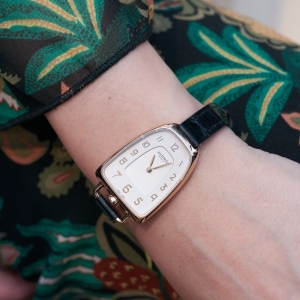 ‘More than a piece of jewellery and more than a watch, Galop d’Hermès is a style object devoid of any formalism. It is free-spirited, witty and passionate.’ – as Mr Delhotal says. Whether it becomes a new icon, only time will tell. 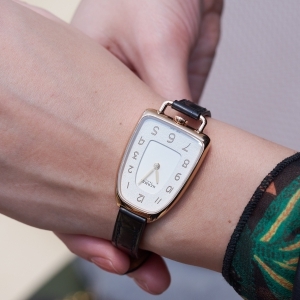 What is certain is that the design connects to the roots of Hermès but is very contemporary, too. I loved it on the wrist. 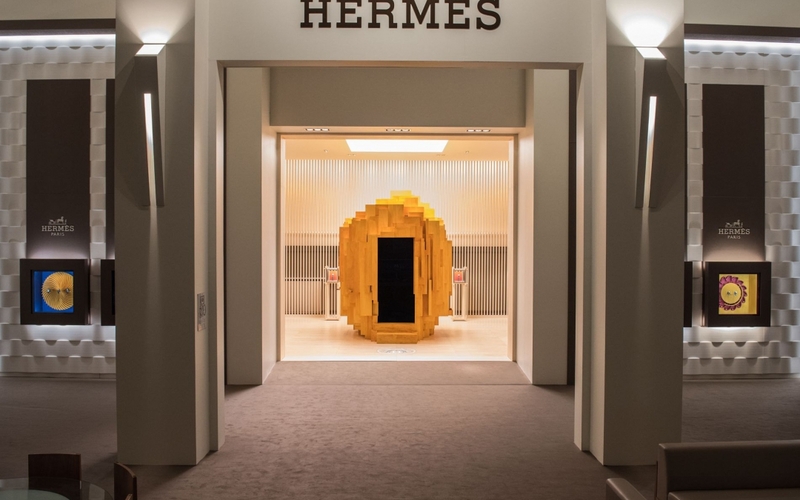 Hermès stand at SIHH 2018 designed by Denis Montel PRESS RELEASE: Maison Hermès is presenting a new vision of time with a unique exhibition space at SIHH in Geneva this year. 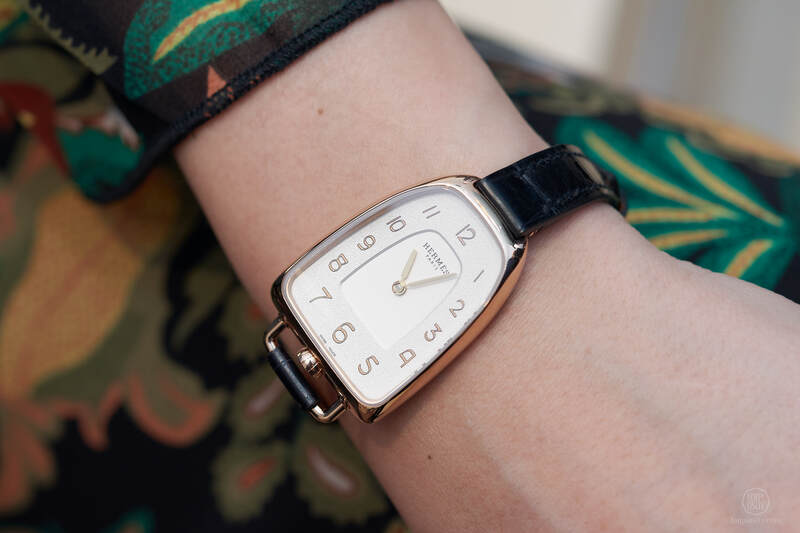 Hermès at SIHH 2018 For the first time Hermès joined SIHH this year. 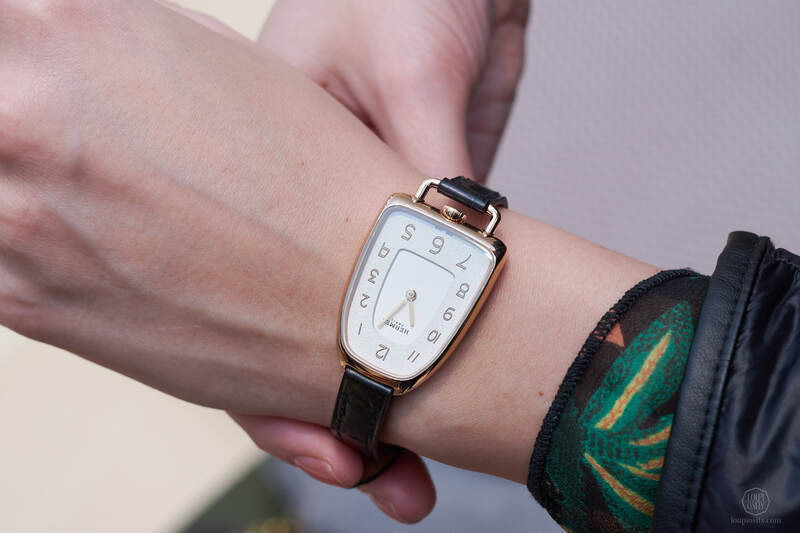 Based on their exceptionally stylish booth decorations at Baselworld, everyone including us expected something similarly inimitable Hermès at the Palexpo in Geneva. In the Year of The Game, we visited the company at SIHH 2018. 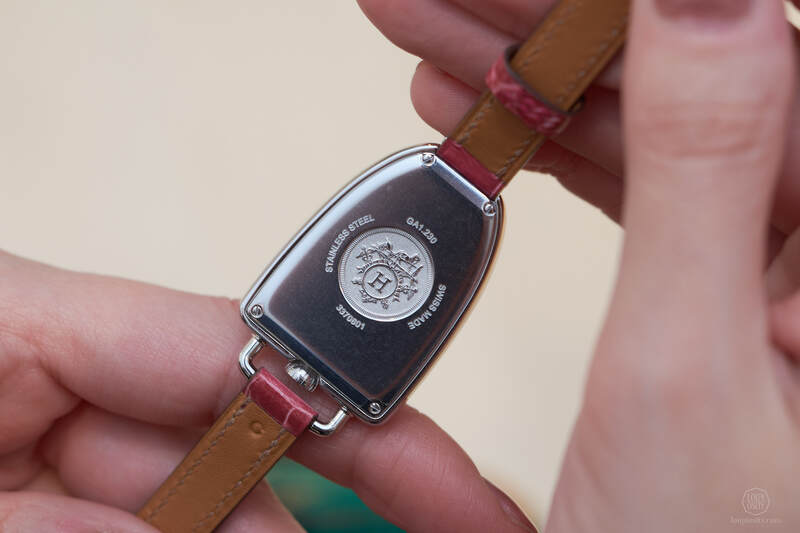 Hermès at Baselworld 2017 Creativity is free to soar at Hermès which result cheerful artistic and technical timepieces. We checked out their 2017 novelties in Basel.